The text is I Corinthians 11:23-26. Do you know why people say that when someone sneezes? The practice goes back almost to the time of Christ, but nobody knows for sure how or why it got started. There are a number of interesting theories out there. Some think it started during an outbreak of the bubonic plague as a way of commending people to God’s care when nothing more could be done for them (i.e. “It’s been nice knowing you”). Tibetan Buddhists believed that sneezing provides a moment of “clear consciousness” (like dying, falling asleep, or meditating) during which one might be able to achieve Enlightenment. But my favorite explanation is this one: when you sneeze, your soul is temporarily dislodged from your body. The blessing makes it go back in so that the devil won’t come and possess you. The light of reason brought us out of those dark ages and into the modern era, where humanity has grown by leaps and bounds. We’ve landed on the moon and created a global communication network so efficient that I could just flip out my phone and have a conversation with someone in India if I felt like it. Letting go of these old superstitions has, on the whole, been a good thing. But, like everything else in this world, our so-called Enlightenment has its dark side. We now live in a world that is “disenchanted”. We’ve lost that sense of meaning and connectedness with the world around us. We no longer see spirits and fairies in the trees and rivers. If we think of God at all, it is as some distant and abstract Creator who has little or nothing to do with the world as we know it. Naïve superstition gives way to cynical materialism and we see ourselves as random collections of atoms that just conveniently happen to make consciousness possible. The world around us becomes an empty shell of resources just waiting to be exploited for profit. Human life becomes equally meaningless under this mindset. What matters is gaining the upper hand in the ongoing battle for survival (which we all eventually lose). We needed to drop the ridiculous superstition of the middle ages, but I wonder if maybe we threw out the baby with the bathwater? Secular and religious folks alike have lost all sense of connectedness to God, the earth, and each other. Both sides are saying that this earth just doesn’t matter. Is there some way to reconnect with that larger sense of meaning and mystery in the cosmos without going back to that ridiculous superstition? I think so. We’re currently in the middle of a five-week sermon series on the Elements of Worship. We’ve already looked at the Word, prayer, and service as Elements of Worship. Next week, we’ll be talking about relationship. This week, we’re talking about sacrament. The word sacrament comes from a Latin word that means mystery. When Christians talk about sacraments, they’re typically referring to one of two church events: Baptism and the Eucharist (a.k.a. 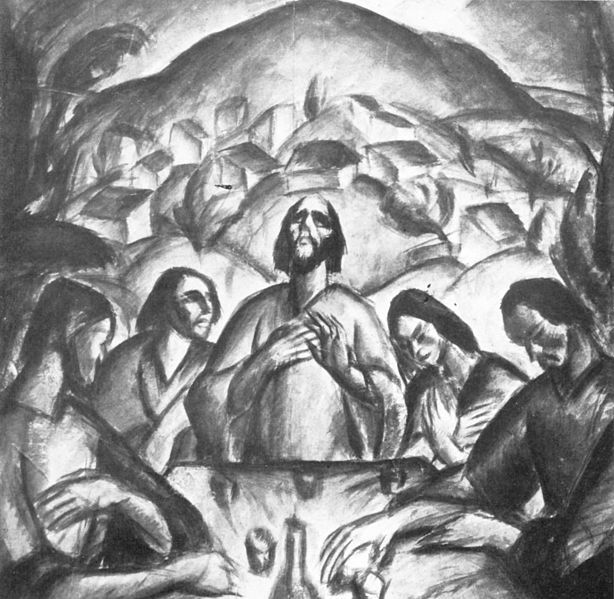 the Lord’s Supper or Holy Communion). A few weeks ago, we had a service where talked about the sacrament of Baptism at length in the sermon. We even baptized three new people into our congregation. So this week, I’m mainly going to focus on sacrament of the Eucharist (which we happen to be celebrating in our service later today). In the sacrament (mystery) of the Eucharist, we celebrate three realities. First, we remember Jesus: who he is and what he did. Jesus revealed the heart of God to the world in a way that no one else ever has. He “gave himself for us” in a life of service and love. We participate in that act of self-giving when we remember him and receive his gift of himself, his body and blood, into our own bodies. Second, we participate in a present reality. Remember the old saying, “You are what you eat”? Well, it’s true. We are the body of Christ. Through him, we are also part of each other: one loaf, one cup, one body, one family. They also say that “blood is thicker than water”. In this case, the blood of Christ is thicker than our own blood. The blood of Christ flows in our veins. Gone is any illusion of pedigree, race, nationality, status, or caste. As Christians, this is where our loyalty lies. This is where our true identity is to be found. Blood is thicker than water and this blood is thickest of all. When we target, discriminate against, or otherwise antagonize those who have been to the table of Christ with us, we are turning our backs on our own kin. This is a truth worth remembering whenever we are next tempted to divide the world into “us” and “them”. Finally, Christians at the Lord’s table anticipate the future with hope. Christ told his disciples that he would drink wine with them next when the kingdom of God comes in its fullness. The end of history is often described in the scriptures as a fully-catered wedding reception. The bread and wine we now eat and drink around this table is a foretaste of that coming celebration when all things are made new, justice and equality are established on earth, and (as it says in Revelation) “God will wipe every tear from [our] eyes. Death will be no more; mourning and crying and pain will be no more.” When the tides of despair threaten to overwhelm us, we have these edible tokens to hold onto. They are the aperitifs of the heavenly banquet. In the Eucharist, we are fed with spiritual food. This sacrament, I think, holds the key to reconnecting us with our lost sense of wonder and mystery. Without it, Christian faith too easily becomes just one more product for sale in the modern marketplace of ideas. With it, we are able to “taste and see that the Lord is good.” Through this sacrament, we touch the mystery of Love that springs from the very heart of the universe and reaches out to its edges. Just as we say in the Great Thanksgiving, I invite you to “Lift up your hearts” to see that “heaven and earth are full of [God’s] glory”. We Presbyterians are used to thinking of our Sunday worship as revolving around the central event of reading and preaching God’s Word. This is true. But it’s also true that we worship in a binary system. Our liturgy revolves around the twin stars of Word and Sacrament. They are meant to go together. John Calvin, one of the founders of our tradition, urged his churches in Geneva to celebrate Communion weekly. Calvin told them that, yes, the scriptures make up the foundation of the church, but the sacraments are its pillars. The church won’t stand up without both to support it. Let’s make sure that we are not starving ourselves of Christ’s spiritual food and drink. The moment of real transformation comes when we begin to see the presence of Christ, not just in this bread and wine, but everywhere we look. This is what it means to “lift up your hearts” and see that “heaven and earth are full of [God’s] glory,” as it says in the liturgy. The more regularly we honor the presence of the sacred mystery in this bread, the more we will begin to see it in all bread. And we will see that, like this consecrated bread, all bread is meant to be shared. So let’s share our bread with those who are hungry. And I’m not just talking about literal bread either: let’s share the bread of freedom and equality with all. Let’s learn to share the bread of work, education, healthcare, and housing with those who are also our brothers and sisters. They are God’s children and we are one family. This sharing is a sacramental sharing. It’s an integral part of what we do here on Sunday. This whole universe is sacred. It is infused with divine glory from stem to stern. Our celebration of the sacraments helps us reconnect with that mystery. Let’s make that connection as deeply and as often as possible, so that it might stay with us as we go out from this place to share our bread with the hungry and be the body of Christ in the world. Lift up your hearts. Heaven and earth are full of God’s glory. Let us give thanks. I’m glad you stumbled into University Church last summer. I’ve yet to cross the great ‘blog divide’ (it’s a congenital condition tied to age), but your posts are almost always worth paying attention to. Thanks. If I get over to Utica, I’ve heard of a good bagel place to meet. These folks were a Godsend to Sarah and me during a traumatic time while our son was in the hospital. Pulling into Ronald McDonald House, I saw a rainbow flag flying in front of a church and said to myself, “I don’t care what kind of church that is. I’m visiting there on Sunday!” They did not disappoint. The current Methodist motto is “Open hearts, open minds, open doors.” University United Methodist does all three.